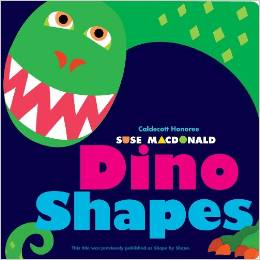 Dino Shapes, written and illustrated by Suse MacDonald, is really fun. It’s also educational, but in a tricky haha you’re learning and you didn’t even know it sort of way. The concept is complicated but presented in a seamlessly simple way. Essentially, through a mix of colours and shapes, MacDonald builds a dinosaur page by page. Each page is dedicated to a new part of the dinosaur’s face, and that part is made out of a different shape. My son (17 months) has asked for the ‘dino’ book three days in a row now. Tonight, he startled me by correctly identifying the oval and diamond. He has a firm grasp on other shapes but these are, arguably, more complicated for a little person to grasp. He also identified the ‘crescent’, but he hasn’t quite articulated it properly yet. I’m certain Dino Shapes is a large part of this early learning.